Of course a primary concern when considering what wine to purchase if you are hosting a celebration is your budget. Only you will know how much you are prepared to spend, although you may be wise to think about what your guests preferences are and what they are used to as well as considering the purpose of the celebration. It sounds daft and a little snobbish, but don’t splash out on very expensive wine if you are having a random event party or a party which you expect to descend into chaos. Save your money for another time. Further, don’t spend a fortune on wine for your friends if they are not big wine drinkers, or if they just won’t appreciate good wine (in fact, if you can help it go for quality cheap wine in any case – your friends will thank you for it, as there’ll be more of it!). There is another tip that immediately related to this last – serve good wine first, and gradually reduce the quality throughout the night. Whoever your guests are they will not be able to appreciate good wine when they are under the influence. Of course, this tip does not apply oif you have planned ahead and can source a lot of very good cheap wine (under £5 a bottle). In this case you can have great wine all night, with one outstanding variety at the beginning. For special occasions Champagne is a must, although these days Cava and Prosecco are equally viable and make a nice change, as well as being cheaper, meaning you may well wish to buy several bottles! 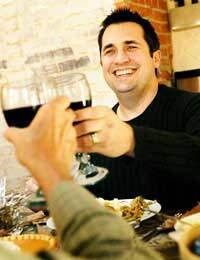 For your first two wines be careful to match them roughly to any food you have on offer (for specific advice on food and wine matching see related article). If you have generic party food perhaps just offer a good red and a good white. In any case your first port of call may be the seasonally produced Observer Food Guide wine list, which gives the 20 best Supermarket wines. If you can bag a few bottles for around the £6 mark (very achievable with the kind of price cuts on offer these days) you will in all likelihood make a splash (one way or another!). Remember, that the wine of 2007 was the New Zealand Oyster Bay Sauvignon Blanc, and it’s a great celebration drink. Failing that, try a Marks and Spencers generic White Burgundy, or a similar Sainsbury’s wine (retailing in both cases for around £5. For a follow up a good New World Chardonnay will go down well for white drinkers, although don’t overlook the very cheap and impressive South African White Wines and Italian wines. A good knowledge of opening markets such as these will impress those around you, especially as people are beginning to cotton on to the fact that good wine can be bought cheaply – and not only from Australian mass producers. As a rule keep the wine flowing. If someone has a near empty glass top it up, but do not encourage rampant drinking if you want to have as smooth party. Offering food and bottled (or filtered) water is key to keeping guests happy longer. Try for a variety of about 5 wines if you want people to enjoy them, and let people know what they are drinking. Finally as a last touch break out the Port as the guests dwindle in numbers, or a around 10p.m – whichever happens first. As an alternative try a Madeira or a quality Sherry. Tesco: 2006 Fern Bay Sauvignon Blanc. At £4.99 a crisp and fruity alternative to the new classic Oyster Bay Sauvignon Blanc that retails at around £3 a bottle more. Tesco: 2003 Berberana Reserva Rioja. £4.49 a strong fruity red that should keep the carnivores happy. Somerfield: 2006, Dios Del Sol Chardonnay, Argentina. Fruity, tangy, Citrssy and deceptively easy on the wallet! 2007 Casa Leona Chardonnay, Rapel, Chile. A hit with the Observer wine writer Tim Aitken, this crisp white proves Chile have something to offer. Borgese Rosso Castelli Ronai, 2005. Various merchants £5-6. A demonstration of why Italian wines are up and coming.